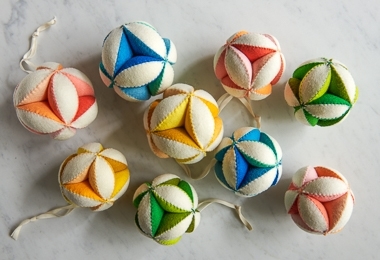 Bright and cheerful, soft and cushy, our Hand Sewn Puzzle Balls will make you smile! A traditional Amish handcraft usually constructed from fabric scraps, our version uses 100% wool felt instead, making them super simple to hand sew. Use yours as festive ornaments for hanging or piling in a bowl, or give them as toys to babies and toddlers, who will wonder at their shapes and bright colors and love their tactility and movement. This Hand Sewn Puzzle Ball Kit comes in three pretty colors, and each Kit includes all the materials you'll need to make four Balls. Please click Product Details, above, for a complete list of the Kit's contents. These are enough materials to make two small and two large Puzzle Balls.